I look forward to hearing from you. Feel free to contact me if you have any questions, concerns, thoughts, suggestions, speaking requests, writing ideas, good jokes, great quotes, wisdom, or mind-bending puzzles. Please fill out this form to contact me. This Christmas, my wife bought me a wonderful book called Notes from a Public Typewriter. It’s a book that came about quite literally from notes that people like you and I typed on an old typewriter in this bookstore in downtown Ann Arbor called Literati, our former hometown. We used to frequent used bookstores, and I have a strange fondness for a good used bookstore. Shadows. We all find ourselves at times shadow boxing. There are sides to us – our personalities, our drives, our gifts – which are mere shadows of who we really are, and they are often, and unfortunately, unbecoming. [Excerpt] ...if you haven't thought about the difference between male and female depression, it's worth a look. Yesterday at South Harbor Church, I preached in our Juggling Elephants series about Sabbath and Sanctuary as God's prescribed antidotes to being Redlined and Unbalanced. I promised second service that I would post some really practical resources for those who might be wondering how to take some steps to real life change from the crazy-making many of us are experiencing. [Excerpt] Is it possible that our trifling with evil in small portions chips away at the heart of our soul? Sounds like a rhetorical question to me. When I think clearly about it, I can find no justification for trifling with evil, and yet how often don't we ingest daily doses in small portions? [Exerpt] It's a really helpful model. ...if you're a leader and this is the type of thing you employ in your actual leadership, I'd encourage you to try on some hats. [Exerpt] What might happen if in humility we willingly submitted ourselves to the people we know love us who would only hurt us to help us? Do we have those people in our lives we can trust with our open vulnerability, and how might our character be formed for the better if they help us see the other side of ourselves? There is a lot of suffering in the world. You can't miss it if you have your eyes open. There are people around us every day suffering from various things - heart-brokenness, loneliness, bone cancer, job loss, chronic pain, hunger, divorce. Someone I know just lost her baby while 7 months pregnant. Someone else I know just lost their job. Even here in America, there is suffering, but we haven't seen anything compared to the rest of the world. I don't mean to be callous in any way, but my cynical side chuckles a little when I think of the fiscal cliff language and the doomsayers, especially when it's compared to the Great Depression. Just remembering a few chapters of the Grapes of Wrath by Steinbeck would tell us that we have a ways to go before we get even close to that kind of reality. Right now, the fiscal cliff sounds more like a concern over having to cut back on our daily Starbucks or having to wait to buy the next iPhone when it comes out. That's not Depression. We sound more like the whining rich kid than anyone dealing with real suffering. My heart goes out to those who are really dealing with real-life suffering through some of the things I've listed above. Or those around the world (and this includes our neighborhoods) who are worried about not getting food for their children or clean water to stay alive. I think about people who die from easily preventable diseases and millions of people who live in garbage dumps. It's real to them. They have already suffered loss or are suffering or continue to suffer it or are daily living a life of suffering. ...he would make much of unmerited suffering as a means of spiritual redemption. ...Evil must always be resisted, but any suffering, however undeserved, that facilitates the good of the whole must be embraced. The acceptance of unmerited suffering identifies the victim with the purposes of God. And we boast in the hope of the glory of God. Not only so, but we also glory in our sufferings, because we know that suffering produces perseverance; perseverance, character; and character, hope. And hope does not put us to shame, because God’s love has been poured out into our hearts through the Holy Spirit, who has been given to us. Clearly to Paul, suffering is not something to be avoided at all costs, but is to be embraced as a part of our spiritual redemption. In fact, Romans 5 goes on to talk about the unmerited suffering of Jesus - the suffering servant - who bore the unmerited suffering caused by our sins upon his shoulders at the cross for our redemption. In a world in which we do our best to build lives that guard us from all suffering, in which we seek to remove all suffering from our families and our bodies, in which we design every possible system to relieve us from suffering, we are called to a gospel - good news - that embraces suffering. And in many ways our suffering is merited because we have sinned, and we experience the consequences of sin all day long. Paul again reminds us in Romans 8 that even though we experience death all day long, we are still more than conquerors through our God who loves us in Jesus Christ who saves us. I'm not sure we are to seek after suffering. I'm no sure we should embrace suffering as a great friend. But I do know this, that through the seasons of suffering, our faith is tried and tested and refined. I know that you can't manufacture the kind of character that is fashioned in the crucible of suffering. I know that you don't need a Savior unless there is something you need to be saved from. One last thought: violence. Violence - even defensive violence - is often a natural response to fend off suffering now or potential suffering in the future. 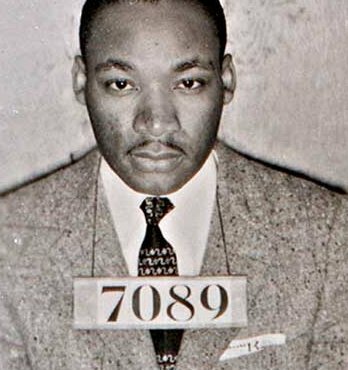 King's non-violent response to oppression and unjust suffering placed upon blacks during and before the Civil Rights movement (and still today) is born out of a deep theological commitment to join Jesus in the embrace of unmerited suffering as a means of spiritual redemption not only for the one suffering, but also for those who might be causing suffering or those observing. How we respond to suffering in itself is witness to our trust in the one who suffered much and overcame (King Jesus, not ML King). When we respond to suffering by violence, it may just be that we are missing a powerful opportunity to empathize with Jesus and so to become forged in a similar fire as he was. Or maybe it's just late at night and I'm rambling. One of the writers I love to read is Malcolm Muggeridge. I'm not sure why, but his combination of journalism, seeking after God, his transformation to Christ, his keen political eye, and his incredible experiences make for interesting reading that - for me - leads to worthwhile pondering. Here is a quote from the introduction to The Third Testament, which was original a TV series, I think for the BBC. Considering [Saint Augustine, Blaise Pascal, William Blake, Søren Kierkegaard, Fyodor Dostoevsky, Leo Tolstoy and Dietrich Bonhoeffer] as a group, it became clear to me that, although they were all quintessentially men of their time, they had a special role in common, which was none other than to relate their time to eternity. This has to be done every so often; otherwise, when the lure of self-sufficiency proves too strong, or despair too overwhelming, we forget that men need to be called back to God to rediscover humility and with it, hope… Between the fantasies of the ego and the truth of love, between the darkness of the will and the light of the imagination, there will always be the need for a bridge and a prophetic voice calling on us to cross it. Those are the kinds of sentences I long for in books I read today, and can't seem to find that often. I find the challenge of a phrase like "relate their time to eternity" throws me off balance for awhile and makes me think deeply about my own life and how my actions, words, and thoughts relate to the eternity that God has set before. What conviction comes when you read a phrase like, and realize that the lure of self-sufficiency has grown strong, or maybe said differently, the lure of the illusion of self-sufficiency. How many times have we seen throughout history those who have had to discover or rediscover humility? How many times have we seen the mighty fall to their own failures, or implosion into depression because of unrealized, wrong-headed hopes and dreams? How true it is that "between the fantasies of the ego and the truth of love, between the darkness of the will and the light of the imagination" we do need a bridge or otherwise we fall headlong into a chasm of self-destruction of our own digging. Hope. The prophetic voice calling. The truth of love. The light of the imagination. The rediscovery of humility, reliance, and the power and sufficiency of our God. These things are worth pondering. Last week I read And: The Gathered and Scattered Church by Hugh Halter and Matt Smay, and am finally blogging a few of my thoughts. I had heard of this book initially after a few friends were at Exponential this year. I couldn't go because I'd just been at the Q Conference in Chicago. However, I probably should have been there because I'm in the throes of planting Fair Haven's first multi-site right now called South Harbor Church (a week and a half from the first preview, with launch on 10.10.10. ), but I couldn't give up the Q experience. Overall, I enjoyed the book, and will recommend it to several people - particularly certain chapters. Let me begin with a critique, and end with some things I liked. The premise of the book is basically to stop fighting over different models of the church and honor one another in our differences but seek to use whatever models work in seeking the kingdom. The book talks often of mega and mini churches, and of missional and attractional. These are important dichotomies on the one hand - and ones I've struggled with myself. On the other hand, it's too easy a division to hang a hat on and there are deeper issues than the book goes into. Ultimately, I love title, but think the book got into too much about Adullam (Halter and Smay's church), and only scratched the surface of these deeply ecclesiological issues of our time. "And" does a good job of articulating the need for working together through various models with the same ends in mind, but in my estimation never gets to some of the deeper issues about how much a model influences the end goals. For instance, Halter does a good job talking about moving people out of consumerism and into transformation and into dying to oneself for Christ. He nails the issue that disciples are not consumers (chapter 3), but then never really deals with models of doing church these days that promote consumerism of a Christian sort. In an effort to be unifying, Halter sometimes borders on not being critical enough where healthy critique is necessary. Other times, though he says that both types of models are helpful, but then tends to tip towards favoring the missional impulse. One question that would be more helpful to me would be around how the mega church can remain missional enough to be Christian and how does the missional church become attractional enough to stay alive and have an influence beyond a small group. Overall, I think he tries to be balanced between multiple models, but speaks only out of the Adullum experience. It would've been nice to see a balanced approach in this book with multiple models all expressing the unifying aspects of the gathered and scattered church. "Whether you're starting from scratch and moving down the missional flow or starting from an existing structure and moving up, you'll notice that the center of the process is 'incarnational community.'" By incarnational community, they mean here bands of people with the missional heart of God integrating their lives with those who don't know Him and are doing something intentional about. Simplistic, yes, but true none-the-less. Too many churches lose the core mission of God to reach his people far and wide and lose their very nature as church altogether. For me, chapter 4, "Spiritual Formation for Missional Churches" was the best chapter in the book. This chapter really deals with how to move someone from being far from God through the discipleship and growth process to the place of mobilization in ministry (in their words from Observance to Preparation to Participation to Partnership). This is such a key issue, and one that churches tend not to do well. We call it a "people pathway" or a "people process" - but who wants processed people! However, churches today desperately need a pathway of discipleship that includes evangelism, grounds people in the basics, and moves them towards influential leadership in the use of their gifts. With studies like Reveal and churches realizing their lack of depth, discipleship pathways are getting popular. Chapter 4 is all about how to go about that, focusing on the transitions in stages, and developing a clear pathway. I like it. This chapter is one that I will recommend several people read. All rights reserved. Copyright Tom Elenbaas.